So Christmas has come and gone in the blip of an eye. My Christmas day consisted of opening my one lonely present from one of my English corner students, which turned out to be a fantastic flask which I now love. I then had to do oral exams with my Elective students. After that I had to rush back to the apartment and quickly get ready to head to Chengdu city, where I met some other people from the company and had Christmas dinner together. It was good to be with other people during Christmas. I was eating with my knife and fork but I longed for chopsticks. I actually prefer using chopsticks now! At 10:30pm we all rushed to the subway to get home, as it closes at 10:45pm. At 12 o clock I Skyped the family, making me miss home and become depressed that I was stuck in China, I didn’t have my Mammy’s Christmas dinner, and I couldn’t sit with them enjoying an Irish coffee and watching Christmas movies. But we did have a CHRISTMAS TREE! Our lovely Chinese friends got us a Christmas tree, with Christmas decorations and little notes on it saying Happy Christmas. It was great! The apartment looked like a disco with all the lights going. So last Sunday I headed to the Amusement Park with my Chinese friend. The weather wasn’t great so there wasn’t many people there, meaning NO QUEUES. It was great. We went on the Big Wheel, the bumping cars, which are FAR better than the ones at home. You don’t have to go around in a circle. The only thing is the accelerator and wheel is on the left, meaning I had to use my right foot to make it go. It was too strange using the left. We also went on THE DROP. Now I’ve only been on one of these once, and I said I’d never do it again. My friend said he was never on it before, so I said ‘COME ON, WE’RE GOING ON IT’. I dragged him. But when we reached the top I literally nearly had a heart attack on it… I definitely won’t be going on that again. Then there was another ride where two people are together and it puts you upside down on it, literally. The thing is spinning around in circles and we are upside down on it for about 1 minute. We then went on a mini roller coaster. But before we got on it, one of the workers made us do STRETCHES. We had to roll our heads either side, move our bodies and our arms…. Just to go on a ride! Only in China! It was a great day, where we went to a fancy Hot Pot restaurant to end the day. 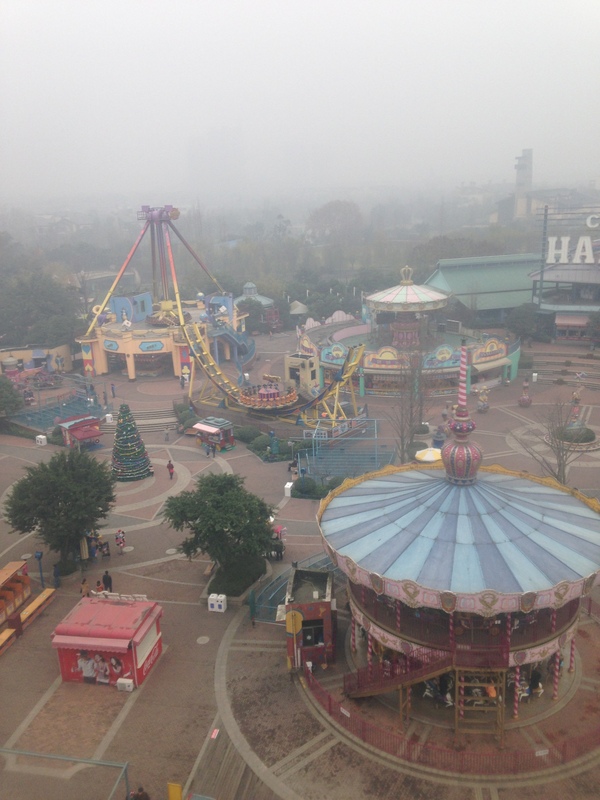 A deserted looking amusement park. So yesterday, we were invited out for a fancy meal with some important people from the college, including the vice-president. When we heard we were going to the school canteen, we thought ‘oh….’ But we ended up going into a room adjacent to it, especially reserved for VIP’s. The room was gorgeous, with fancy plates, chopsticks, the lazy susan was electric meaning it turned automatically and plenty of rice wine and red wine. I opted for Beer, and I must say Good Call. See in China, most of their meetings are held not in a board-room, but in a restaurant. This is where all of their decision making and deals happen in business. Usually a lot of food is eaten and A LOT of beer is drunk. My Chinese friend said that if a person is going for a meal with their boss, that person NEEDS to be able to drink a lot. This shows, to their boss, that this person is a good, hard worker. If a person hardly drinks any, this will give the boss a bad impression of them. So in China, being able to handle your drink is very important! Although this generally only applies to men, as the lady’s need to be more ‘lady-like’. At the meal, we were presented with Chinese tea by our bosses, they did a little toast and we started eating. Actually eating was a bit of a struggle, as every 3 minutes someone from the table would come over and toast just you. We were told that we should go and toast our bosses and say something like ‘it’s very nice to meet you…’ So then when I was finished toasting them all, id only be sitting down when ANOTHER person would toast me! This led to us drinking quite a lot of alcohol! After 3 big bottles of beer I was getting quite tipsy, now I’m not one who drinks all the time, so I rarely have 3 bottles of beer. I would fill my glass up with beer, and when I would do that, one of the Bosses kept going, ‘AISLING… GĀN BĒI’ This means ‘DRINK IT ALL’. When I would fill the glass up again, he would say ‘GĀN BĒI AISLING’ .This happened me a lot. I kept forgetting not to fill it to the top. Most of the people were at least tipsy, including the Belgium’s, so it was a great laugh. So we left at 9pm… 9PM! The students were just finished class and there we were laughing and joking, they were probably wondering what was wrong with us. It actually was a great night though, and the food was really nice. They keep the nice food for the VIP’s it seems. Apparently at home its Christmas Eve… but where I am, its just a regular working day. Only difference is some of my students gave me apples. This is apparently what they do during Christmas, give out apples as gifts. I have read extensively about China before coming, but this new to me! But I did get a present from one of my students from English corner, so I actually have something to open tomorrow morning! Although I wont be surprised if its another apple. And I have FINALLY realised why I am so cold all the time. Like I mean Ireland is freezing in the winter, so I should be well used to the weather here… I just feel cold ALL THE TIME. I only figured out that there is no central heating in any of the buildings. No radiator in sight. I have no idea how I didn’t cop this on a while ago… I get so used to having the air conditioner on hot in the bedroom, then I walk out into the FREEZING sitting area. I realise now that I miss radiators! Summer please hurry up! Although it doesn’t feel like Christmas in China, from Facebook status’s and pictures I know it has definitely arrived, so I want to wish whatever followers I have…HAPPY CHRISTMAS! For the expats, I no doubt know your missing Christmas morning and Christmas dinner like myself. As teaching begins to wrap up for this semester, I have been doing oral tests with my Elective students. In 90minutes, I only get about 20 students done, so it’s a slow job! I actually enjoy it though. It’s just you and the student and some of them really surprise me with their answers. I came up with 10 questions, one of them being ‘If you could, what would you change about China to make it better?’ Nearly all of them said the education system. They all say that it’s too difficult, too much emphasis is on written exams, there’s no creativity and they have no freedom to do anything. From what I hear, they are absolutely correct. Even in my classes, a lot of them struggle to come up with anything creative. Where as in Ireland, we would relish it. Too much emphasis is on exams, and then, when they don’t do well in their final, they feel ashamed; the final exam is one of the important things in their young lives. But I suppose, with the amount of people in China, there is a lot of competition for the best Universities. Another question was ‘What would you change about yourself?’ Most of the students said that they are shy, and that they would like to be able to talk more to people. A lot of girls said they want to be slimmer, bigger eyes, and have a smaller nose. It’s interesting to learn what they all think. In the past, it has always been me sitting opposite the examiner; nervous, clammy and dreading it. I never would have thought that I would be the examiner one day! It just shows what can happen in life. You think ‘I’ll never do that’ and then you realise one day that you actually are. It makes me realise what I can actually achieve. I survived 1 semester teaching in China.3 years in the past, I would never have dreamed that I would be doing something like this; living in China by myself, teaching students literally only 2 years younger than me. It just goes to show how life changes, and it’s these things, both good and bad, that shape and mould you into a (hopefully good) person. People come and go from your life; seemingly important ones at a time, seem to just drift away, while new, exciting people enter your life. It’s this that changes who you are, and makes you a better person. I’ve gone all philosophical now. I’m just reminiscing about the last few months. Without a shadow of a doubt, this experience has made me a better person. There were times when I thought, numerous in fact ‘I don’t think I will be able to live in China… it’s just too different’ While I wasn’t very happy at home with the lack of a job, I was in my own wee bubble, my comfort rut. Everything was the same, unchanging, mundane, but It was what I became used to, and it was very hard to leave it all behind! But I think it’s just a big push I needed. I thought one day, ‘right, I’m going to apply for this China thing’ and I just done it. I asked my Mum and Dad what do they think…and the same night I applied. I think that’s what a lot of people need to do. Just Do It. I’m so glad that I did. 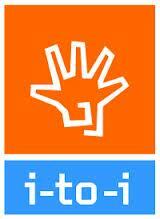 I hope now that when I do go back home, I will be a changed person. I can’t wait to tell everyone about China, its good and bad points. From people spitting in the street, to the people who work in the tea shop literally running over to us and beaming, just so excited to see us. It’s these kinds of things that make China…CHINA. You just have to accept it the way it is, it’s not going to change. I can’t wait to teach the family about China; its history, its people and their way of life. They will be amazed! We’re off to see the Pandas. With only like 4 weeks until I am finished, my PARCEL finally arrived! 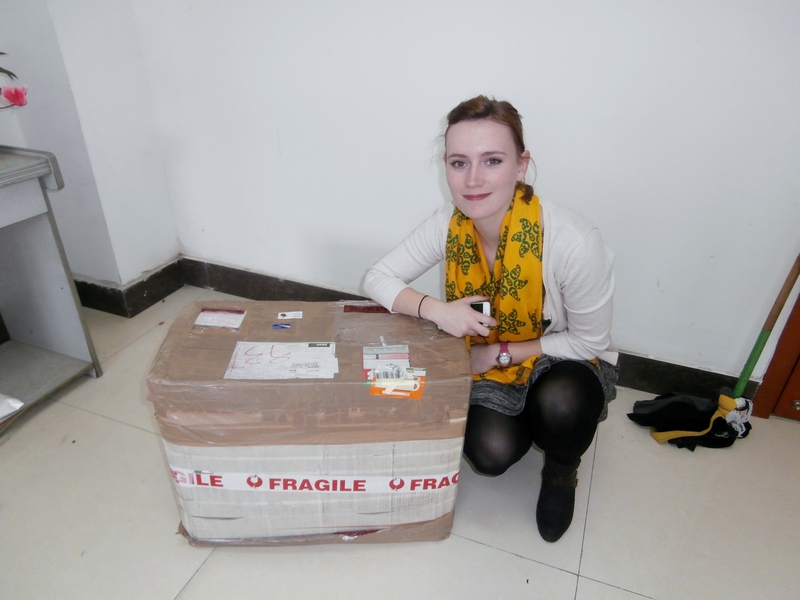 It has taken over one month, where it has been sent BACK to Ireland from London, it didn’t even reach China. So my Mum had to send it again, arriving on Wednesday. She has stuffed it full of sweets, Tayto crisps, Pringles, tea, coffee, tights, soups, clothes to last me forever, pyjamas (one of the best things she put in it), pasta, hair bands, pop socks, make-up remover wipes (very useful) and of course, a Christmas jumper with a reindeer on it…and a Christmas Pudding! Ha I was shocked to see a Christmas pudding of all things in it. Some of the more random things she put in it is about 20 chicken stock cubes and about 3 full tubes of tomato puree. To my surprise, Mum made a little parcel for my room-mate too! While I wasn’t in great form during this week, my parcel really lifted my spirit. Thanks Mum! The job I had to get it from the office to my apartment was a struggle. That day I decided to wear high heels, so after work I had to carry the HUGE box, in the dark to my apartment. My arms are still aching from carrying it! So the next night me and Charlotte decided to make pasta with our tomato sauce. We cheated a bit, where we went down the street and picked up some mushrooms, veg, chicken from a food vendor. They cook their food on their own home-made ‘cooking area’ on a sort of Tuk-Tuk bike. We usually stick to one man because we know he has nice food. We selected our food then he cooks it for us. We headed back to the apartment where we enjoyed our lovely tomato pasta and veg dinner! It was so nice to have something different. On Friday night, we had our weekly movie night in my Chinese friends apartment. In advance, we tell him what films are good so he can download them for us. I chose ‘Seven’ with Brad Pitt and Morgan Freeman. I have seen this movie several times I think it’s great. Neither of the other 2 had seen it so I thought it would be a good choice. Another good film is ‘The Bone Collector’ so we might watch that another time. We plan on watching a Christmas movie at Christmas so I’m looking forward to that! 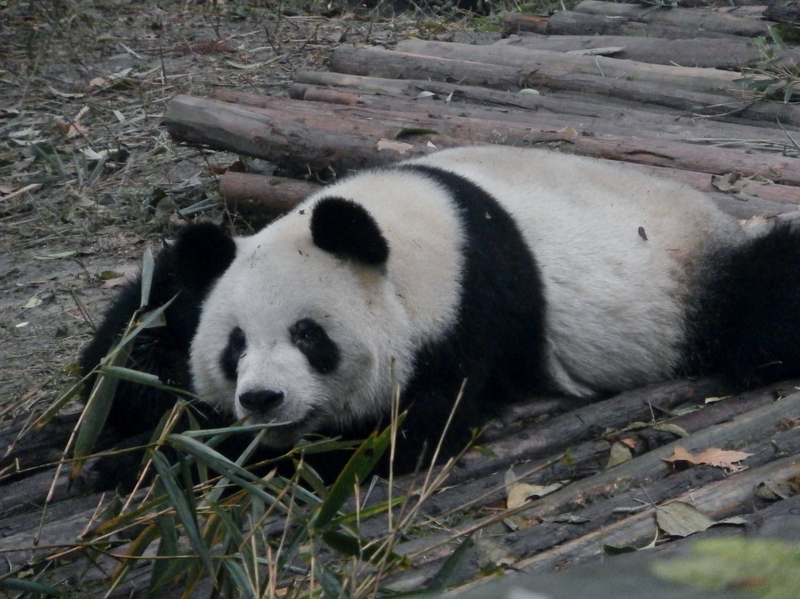 Yesterday we decided to hit the Pandas! 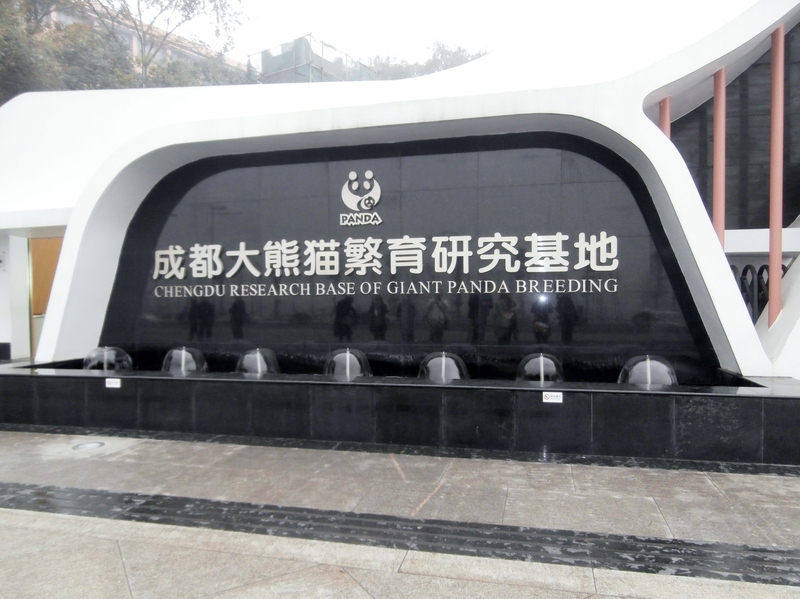 Typical, the weather wasn’t good and it was raining, meaning the Pandas would be kept inside because of the rain. It stopped though as we arrived, meaning all them were out. They have the life! Lounging about, pretty much sleeping and eating, maybe climbing a few trees if they’re feeling adventurous. We also saw the baby pandas, asleep inside. They are like big balls of fur. Their so cute, or as my Chinese friend said ‘they are sweet’. After the Pandas, we got dinner. We were all starving at this stage. We got a typical Sichuan dish called mao cai. There are shelves full of food where you pick what you want. We picked meat, veg, shrimp dumplings, tofu, lotus, mushrooms, beansprouts, potato and pumpkin. They then cook the food for you, and give it to you in a large bowl full of spices. It is similar to Hot Pot. Usually mao cai is served individually, where each person would get their own bowl with what they picked, but because we were such a large group, we got 3 large bowls of food to eat together. I love this dish and the food is really spicy. With our belly’s full, it was then KTV time. 2 of the Belgiums decided to head back to the college, so there were 7 of us that went to it. I have never been to this one before. There was a large selection of music and the sound system was a lot better than the previous one we went to. We stayed there was about 3 hours, leaving at 10:30pm. It was too late to get the subway back because it was closed, so we had to try and flag a taxi to take 5 people back to the college, which was about 1 hour away. Although it was difficult, as they don’t usually take 5 people in a taxi, we managed to get one. I was squished in the back with the 3 Chinese fellas, but the time went fast, teaching me Chinese phrases…ha and laughing when I said it wrong.Chinese is too hard!